Shape Up Saturday: Ow! My back! To begin, I’ve already seen so many people with lower back pain that I believe this week’s exercises won’t work for everyone at any given moment. Like those exercises I’ve picked in my previous posts, these are some of the safest exercises/stretches I can offer, BUT I can’t emphasize enough that it’s important that you know your body and listen to it. Developing an awareness of how you hold your body and why can go a long way. So, you know. Consult your doctor and all that, especially you people with herniated disks and stuff. A lot of times you can still do these exercises, but every situation is different. Be honest with yourself – which way to do you stand? 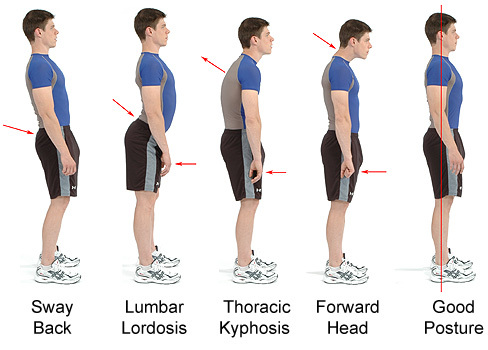 Correcting your posture (using gently engaged core muscles) will save you from a lot of discomfort. 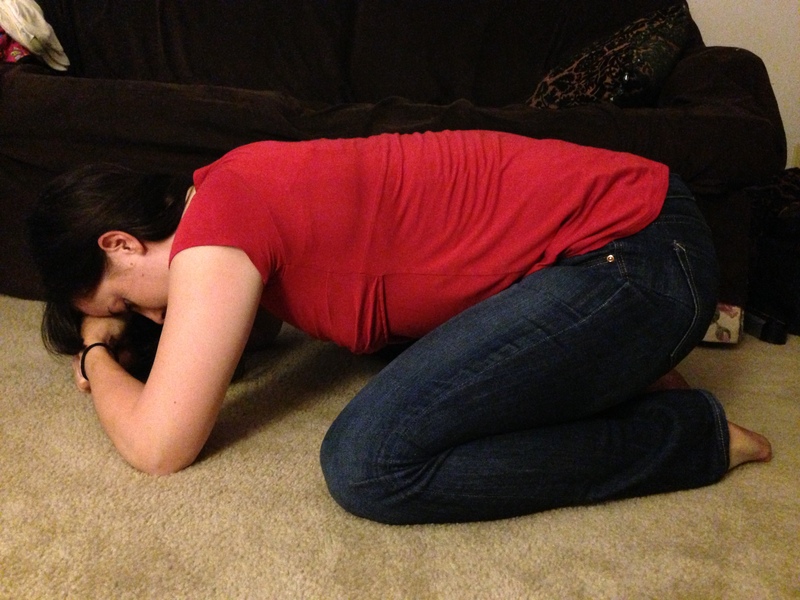 Notice that my back is relaxed here – the goal is not to touch the toes, but to stretch the sides and the back. This may extend the stretch into the hips a bit. Another pose that may gently stretch and release the back is Child’s Pose. Your knees hurt when you bend them like I am, you say? Then roll up a small blanket and place it between your hips and your heels. 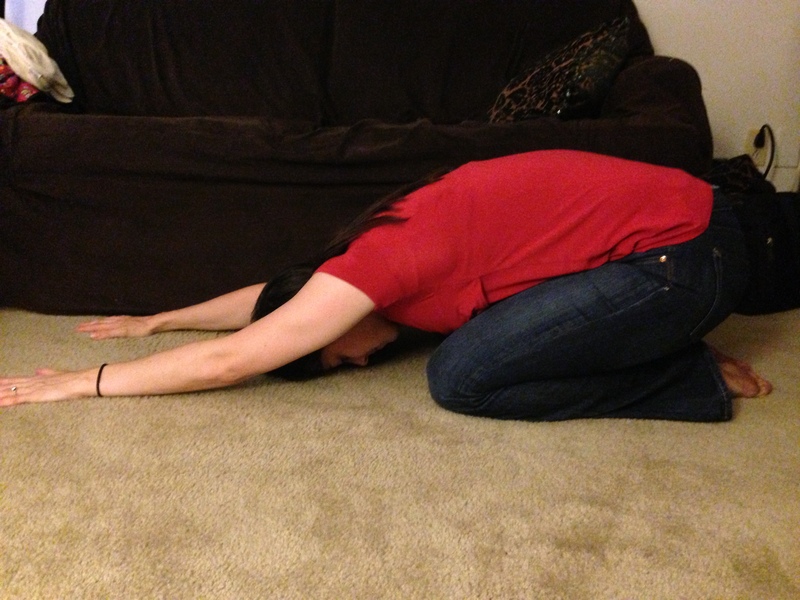 Modified child’s pose – see which one feels better, and do that one. Often gently rocking the pelvis forward and back (using the abdominals, not pushing with the feet or squeezing the rear) can remind the back to relax. It’s also a great way to practice correct posture. In this first picture I’m arching (I know my clothes make it hard to tell the difference) and in the second I’ve pulled the front of my hipbones up, which aligns my spine without much effort involved. 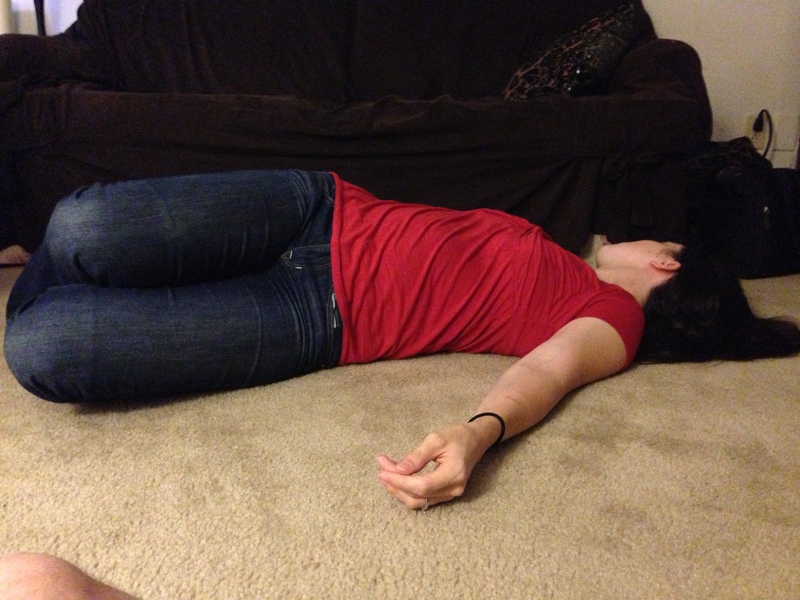 Arched lower back – my spine is not happy in this uncomfortable position. Abdominals gently engaging to create a comfortable neutral spine. From that neutral spine you can also roll up into a Bridge, trying to lift off one vertebrae at a time, and then slowly lower back to the ground the same way. If you care about breathing (and if you’re reading this, you’re alive and I assume therefore that you care a great deal about breathing), you inhale to prepare, exhale while rolling up, inhale at the top (zipping the abdominals together), and exhale while rollling down. 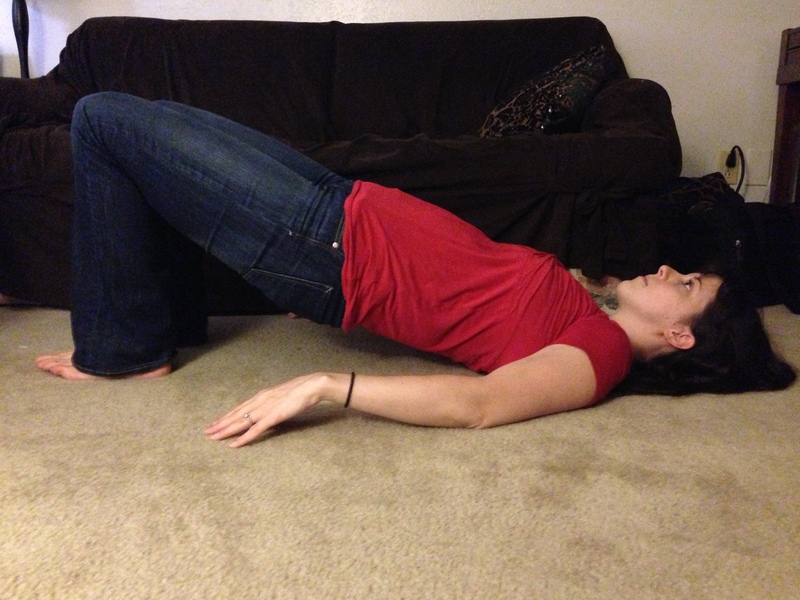 From neutral spine continue rolling all the way up to a Bridge – notice my ribcage isn’t pushing up. Here is Bridge in its 6 second glory: https://vine.co/v/hppbqjBV5hY and https://vine.co/v/hppb9E7TYgj. Why are the clips sideways? Because my husband accidentally filmed them that way, and I let it go this time… this time. Gentle spine ‘twisting’, such as the Mermaid (or Merman, of course) I am demonstrating below can also help relieve tightness in the back. 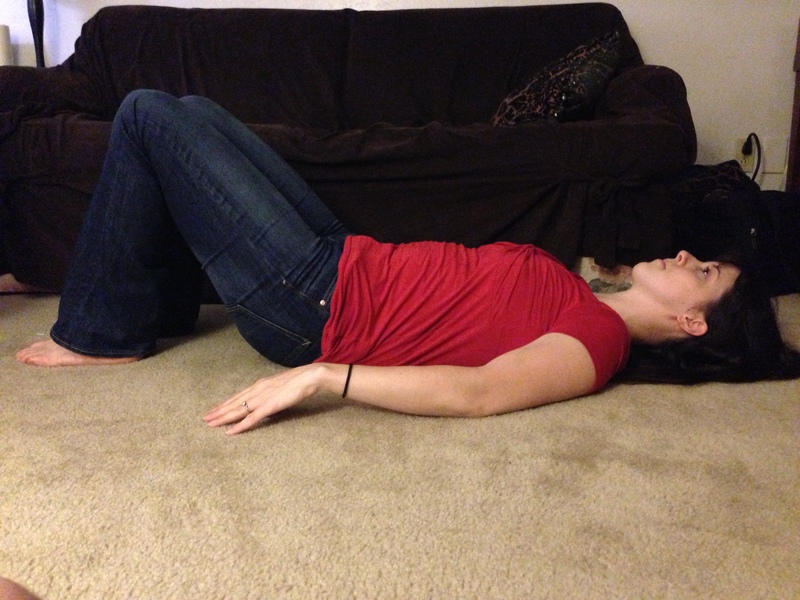 Keep the ankles and knees gently drawn together as you lay there. Notice my face is turned away from my knees – this increases the stretch. I’m also -gently!- keeping both shoulders on the ground. If you can’t keep the shoulders on the ground just yet, that’s okay! It will come, grasshopper. Another incarnation of Mermaid – ahhhhh. So nice. 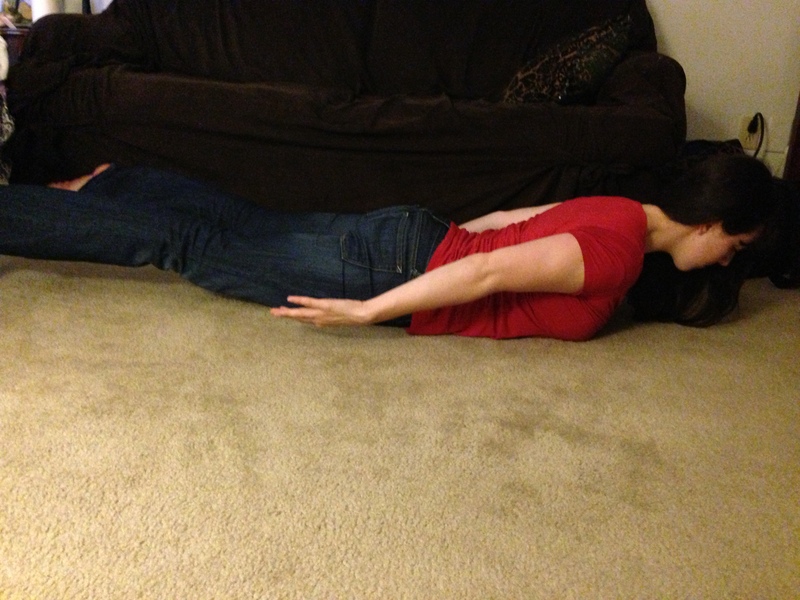 The last exercise I’ll offer for strengthening the back is Locust. While lying on your stomach, forehead resting on the ground and palms facing the ceiling, engage the abdominals so you feel like you’re ‘lifting’ them away from the ground. Lengthen the legs and arms behind you and then lift them off the floor while lengthening and lifting the head forward. (It is key that your body works together as a unit here.) 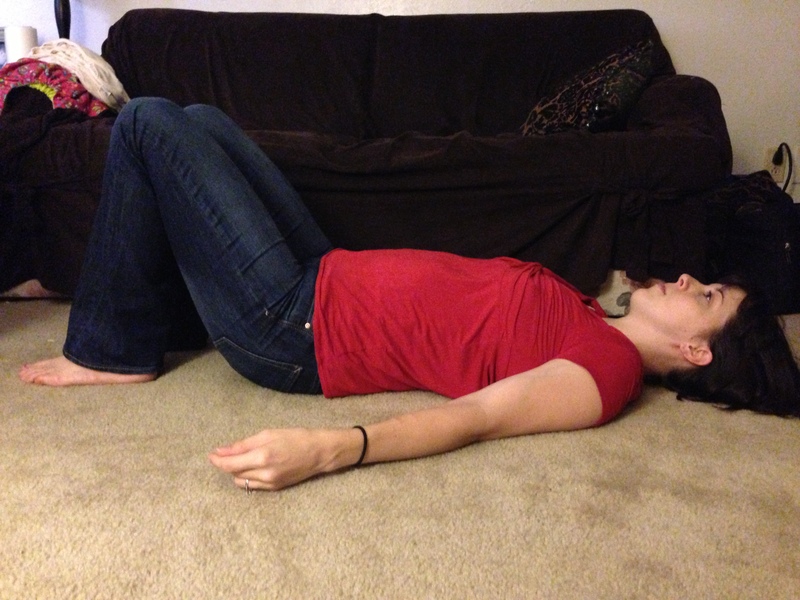 Take a few breaths here, and then lower the body and rest in Child’s Pose, like I demonstrated at the beginning of this post (you always want to round the back after arching it). And here is Locust, if we’re talking yoga. Flight if we’re talking Pilates, and planking if we’re talking pop culture. And there it is for today. This only begins to get into exercises for the back, but I can only crack this can of worms open so far before I end up writing “Your Back and You: A Promising Relationship” and ignore all my fiction writing, which would make me sad. That’s not my book to write. Let me know which exercises worked best for you!